Brainy Bike Lights® have the ability to enhance cyclist standout and speed up reaction times in drivers - using brain science to help make urban cycling safer. RECHARGEABLE TRIANGULAR LIGHT NOW AVAILABLE! Why these bike lights make you stand out? The set of front and rear Brainy Bike Lights will help you stand out from both directions. As with normal bike lights they fit onto the handlebars and seat post of your bike. They use edge lighting to ensure a crisp sharp symbol shining out, telling motorists you are there, even at a considerable distance. These cyclist symbol lights will tell other road users exactly who you are. They also alert them to your vulnerability on the road. Cyclists using our Brainy Bike Lights front and rear sets have told us that drivers pass them more considerately, giving them more space. The front and rear lights display a bright, sharply focused bike symbol giving you a clear identity. The bike light symbol communicates directly to drivers that you are a cyclist. The brainy idea behind them is the use of an illuminated BIKE SYMBOL as the front and rear bike lights. This Original Bike Symbol Light©‎ has the ability to give cyclists powerful standout both day and night. Offering amazing visibility and ultra sharp standout at up to 20m in urban light clutter. Read original research conducted by the University of Oxford which shows the potential benefits of Brainy Bike Lights® in terms of standout in urban light clutter and speed of cyclist identification when compared to standard bike lights, as well as supporting evidence from other scientific studies. Brainy Bike Lights® technology incorporates edge lighting for acute angle visibility to help cyclists stand out in urban light clutter and enhance cycling safety. 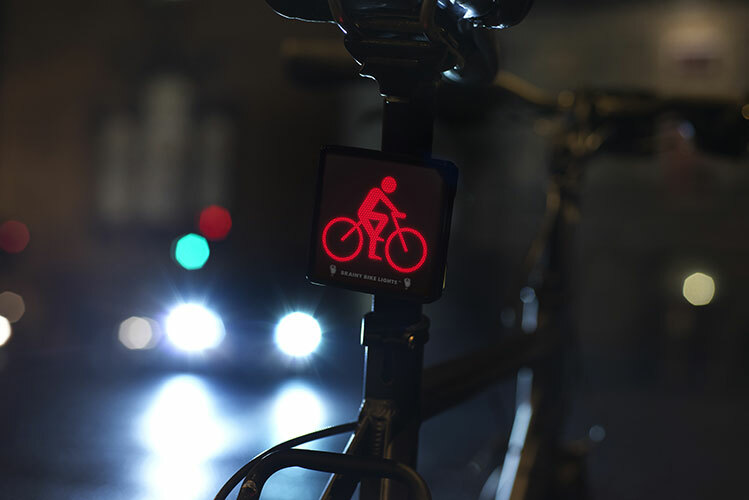 Brainy Bike Lights® were developed by a small team including a specialist in behavioural economics based in Oxford, together with a brilliant lighting engineer and product designer. Read about the influence of behavioural economics on Brainy Bike Lights®. Brainy Bike Lights (R) were significantly more effective than a traditional bike light in standing out from urban light clutter.